The Papers of James Madison: Presidential Series, vol. 7 (edited with Angela Kreider); University of Virginia Press, 2012. The War of 1812: Conflict for a Continent (Cambridge University Press, 2012). The Papers of James Madison: Secretary of State Series, vol. 9 (edited with Mary Hackett). University of Virginia Press, 2011. The Papers of James Madison Digital Edition, 2010 (see http://rotunda.upress.virginia.edu/founders/JSMN.html). Borderlines in Borderlands: James Madison and the Spanish-American Frontier, 1776-1821 (Yale University Press, 2009). The Papers of James Madison: Retirement Series, vol. 1 (edited with David Mattern). University of Virginia Press, 2009. The Papers of James Madison: Presidential Series, vol. 6 (edited with Angvela Kreider). University of Virginia Press, 2008. The Papers of James Madison: Secretary of State Series, vol. 7 (edited with David B. Mattern). University of Virginia Press, 2005. The Papers of James Madison: Presidential Series, vol. 5 (edited with Angela Kreider). University of Virginia Press, 2004. The Papers of James Madison: Secretary of State Series, vol 6 (edited with Mary A. Hackett and Ellen J. Barber). University of Virginia Press, 2002. The Papers of James Madison: Secretary of State Series, vol. 5 (edited with David B. Mattern and Ellen J. Barber). University of Virginia Press, 2000. The Papers of James Madison: Presidential Series, vol. 4 (edited with Jeanne K. Cross, Jewel L. Spangler and Martha J. King). University Press of Virginia, 1999. The Papers of James Madison: Secretary of State Series, vol. 4 (edited with Mary A. Hackett and Jeanne K. Cross). University Press of Virginia, 1998. The Papers of James Madison: Presidential Series, vol. 3 (edited with Jeanne K. Cross and Susan H. Perdue). University Press of Virginia, 1996. The Papers of James Madison: Secretary of State Series, vol. 3 (edited with David B. Mattern and Jeanne K. Cross). University Press of Virginia, 1995. The Papers of James Madison: Secretary of State Series, vol. 2 (edited with Mary A. Hackett and Jeanne K. Cross). University Press of Virginia, 1993. The Papers of James Madison: Presidential Series, vol. 2 (edited with Jeanne K. Cross and Susan H. Perdue). University Press of Virginia, 1992. The Papers of James Madison, vol. 17 (edited with David B. Mattern and Jeanne K. Cross). University Press of Virginia, 1991. The Papers of James Madison, vol. 16 (edited with Thomas A. Mason and Jeanne K. Sisson). University Press of Virginia, 1989. Mr. Madison's War: Politics, Diplomacy, and Warfare in the Early American Republic, 1783-1830. Princeton University Press, 1983. "Soldiers in Peace and War: Comparative Perspectives on the Recruitment of the U.S. Army, 1802-1815," William and Mary Quarterly (2000). "Between Black Rock and a Hard Place: Peter B. Porter's Plan for an American Invasion of Canada in 1812," Journal of the Early Republic (1999). "The Politics of Ending the War of 1812," in War Along the Niagara: Essays on the War of 1812, ed. R. Arthur Bowler. Youngstown, New York, 1991. "Enlisted Men in the U.,S. Army, 1812-1815: A Preliminary Survey," William and Mary Quarterly (1986). "James Madison and the Coercion of Great Britain: Canada, the West Indies, and the War of 1812," William and Mary Quarterly (1981). "The Coming of the War of 1812: The View from the Presidency," Quarterly Journal of the Library of Congress (1980). "James Madison and the 'Malcontents': The Political Origins of the War of 1812," William and Mary Quarterly (1976). "The Problem of Klan Violence: The South Carolina Up-Country, 1868-1871," Journal of American Studies (1974). The Social History of the U.S. Army, 1802-1815. Preparing volumes of the Papers of James Madison for publication, particularly those relating to Madison's second administration. More broadly defined research interests include the political, diplomatic, and military history of the early American republic, with special emphases on the social history of the U.S. Army, 1802-1815, and the Spanish borderlands. 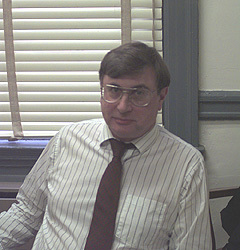 Arthur S. Link Prize, Society for Historians of American Foreign Relations, 1996. National Historical Society Book Award, 1984. J. Franklin Jameson Fellowship, Library of Congress and the American Historical Association, 1978-79. Stuart L. Bernath Memorial Prize, Society for Historians of American Foreign Relations, 1977.